Are you teaching your kids map skills? Reading a map is a life skill that will serve them well in many areas of life. Here are some ways to teach map skills by interweaving them into your life. One of my fondest childhood memories is sitting on my grandpa’s lap looking at his atlas of the United States. Using his finger, he would retrace the routes he and my grandma took on various trip across the country. He would stop at certain points to tell me about interesting things they saw or people they met. Each time I went to see him, he would take me on another atlas trip either out west or down south. We took some of those trips over and over, but I never got bored. We traveled the country and never left his chair. I knew these routes and places intimately even though I had never been there. Those experiences made me want to travel and taught me many things. I learned geography, culture, history, and map skills. Those atlas trips with my grandpa fueled my love for maps. When I was young, I would often trace make-believe trips of my own imagining what I would see or do along the way. When my family would take vacations, I would always be in the backseat with a map or atlas in hand. As we drove, I would track our trip on my map. I would take note of each town’s name and what interesting features were nearby, like forests, parks, or historic sites. My parents would often ask me to find an alternate route or how far we were from certain points and towns. Reading and using maps is a life skill that is dying with the invention of GPS navigation and Google Maps. That is a shame. Maps not only help you not get lost, they help you learn spatial reasoning. Being able to realize the distance between places and where things are in the world in relationship to others, is a crucial skill in understanding our place in the world. When we started homeschooling, my daughter’s first lesson was about maps. I knew that map skills would help her in almost all of her subjects. Just knowing where places are in relationship to each other helps us understand more as we learn. For instance, knowing the distance across the Atlantic Ocean from Europe to North America helps us understand why it was such a dangerous voyage for explorers and the first settlers. My daughter and I looked at all types of maps from simple maps with just streets and symbols to atlases and travel road maps to early mariner maps to topographical maps. I sat with her on the sofa and traced routes of trips I had taken in the past. We chatted about places, people, animals, and funny stories. I tried to make the map come alive for her just like my grandpa had done for me. As we looked at the maps, I taught my daughter how to use the legend of the map and what scale meant. We talked about how far some trips looked on some maps, yet looked closer on others. In no time, she was tracing routes from one point to another and pointing out features and places along the way. The wrap up map skills activity was creating a map of our small neighborhood. My daughter rode her bike up and down the streets counting houses and writing down street names. We used the odometer in the car to figure out distances. My daughter was so proud of the finished product that included houses, the creek that runs through the neighborhood, the woods behind the neighborhood, and street names. After that initial lesson, we wove maps into everything from history to geography to science to a trip to grandma’s house. We hung a world map and a United States map on my son’s wall. There were atlases and maps in the book basket. Whenever we read about a new place, we found it on one of our maps. When we took a field trip, we mapped out a route before we left and followed along on the map on our way. Maps were just part of life. My children are teens now and you can still find maps in the glove box of our car. Although we do use Google Maps, we do break out the paper map from time to time to get the big picture or just to be sure. 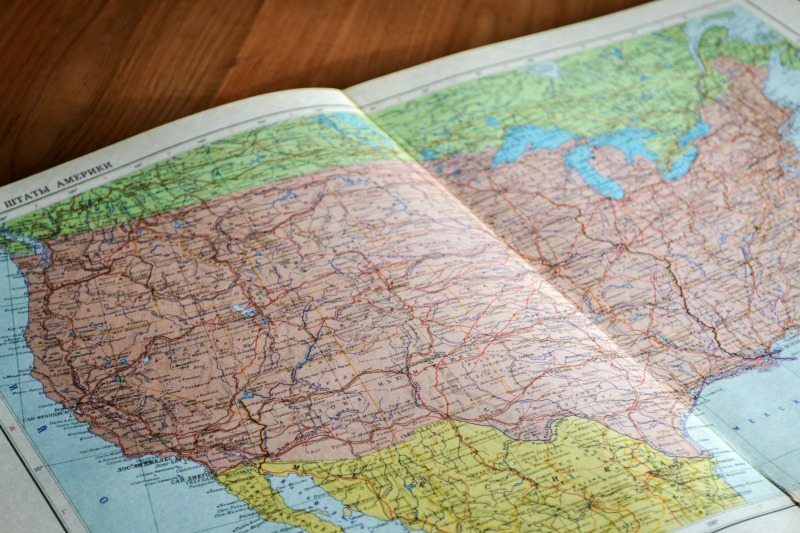 When we plan a travel hockey trip or vacation out of state, the kids know that there will be maps of each state along the way and we will use those maps. I love that they aren’t afraid of maps and when I ask them to find a place or give me directions, they will know how. They have map skills. My kids will not get lost! I am still a sucker for a good map. If I had my way, I would collect old maps, frame them, and hang them on every wall. 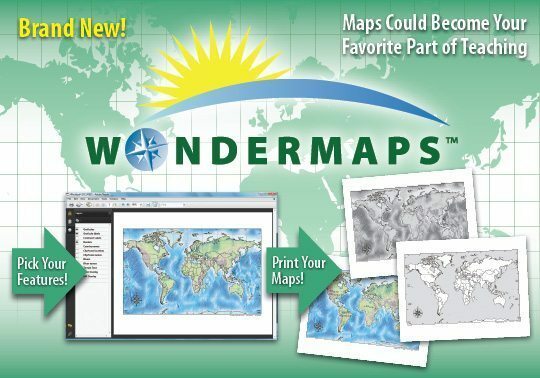 Do you use maps in your homeschool? Is map reading a life skill you are teaching your children? Have you checked out these resources from Bright Ideas Press that will make teaching map skills fun and easy? Bright Ideas Press offers atlases covering different regions and topics. Want to know the truth about homeschool moms? Is it true that they are more patient than other moms? Are their kids perfectly behaved? How do they know enough to teach all their children all the way through high school? Do they all wear denim jumpers? Are they all against public education? Do they secretly want to take over the world? There seem to be a lot of stereotypes and misconceptions about homeschool moms floating out there in non-homeschool circles. It’s time to lay some of those to rest with some truth from a homeschool mom in the trenches. We do not have more patience than other moms. – We hear it all the time from moms who do not homeschool. “I just don’t have the patience to homeschool.” Um. Don’t tell anyone, but neither do I and most of the homeschool moms I know. Our kids get on our last nerve. We throw up our hands and stomp out of the room from time to time. There are days when we threaten to stick them on the school bus the next morning. If super-human patience were required to be a homeschool mom, homeschooling wouldn’t even be a thing. We aren’t weird (at least JUST because we homeschool). – OK. Some homeschool moms are weird. Some public school moms are weird. Homeschooling families do not have the market cornered on weird. Look around. We don’t think we are better moms because we homeschool. – Moms love their kids and will do what they think is best for them. For some of us, homeschooling is best. For others, traditional school is best. Both come with responsibilities and concerns. Good moms make choices based upon their children and their family situation. Period. We don’t judge you if you don’t homeschool. – When other moms find out I homeschool my kids, they usually bring up two things. First, they say the old “I don’t have enough patience to homeschool my kids” thing. Then, they usually start telling me all the reasons their school is so great or why they chose to send their kid to that school. I always laugh at both responses. The patience thing makes me laugh, because in my mind, I am going back to our kitchen table where I have my son in a headlock while trying to make him do his math. (True story. Happens at least twice a month. There’s patience for ya.) The justifying why you are choosing to send your child to school thing really makes me laugh. For starters, they are your kids and I’m sure you are doing what is best for them and your family. But, it mostly comes down to I don’t really care why. I’m too busy trying to not screw up my own kids. We don’t really homeschool. – Seriously. The term “homeschool” should be used loosely in many situations. In our case, and the case of most of our homeschool friends, we don’t spend a lot of time at home. We do school at the ice rink while one child practices skating or hockey. We stop at the library between art class at local art studio and astronomy class at the planetarium to get some book work done. Our kids have done school work in the car, at parks, at restaurants, in waiting rooms, in coffee shops, and at Grandma’s house. We don’t all love science, literature, and math but we learn alongside our kids. – Many moms tell me that they can’t homeschool because they don’t know enough about science or history or whatever. Well, that’s ok. None of us know everything about everything. Learning, or re-learning, with the kids is actually fun. Plus, the kids get to see an example of lifelong learning. I want my kids to never stop learning! In my public high school, world history wasn’t even offered. Really. I was a biology major in college, so I never had to study it there either. Over the years, I learned about history from reading about things that interested me. When the kids started studying ancient history in their homeschool studies, I learned right along side them and loved it! We keep a close eye on the public school calendar. – We don’t actually use the calendar to start and stop our school year or determine what days to homeschool. The school calendar lets us know when the public school kids will not be at the parks or the museums. Homeschool families get so used to having these facilities to themselves, so they stay away from them on school breaks. We sometimes consider sticking our kids on the school bus. – Yes. As I mentioned before, homeschool moms occasionally lose their patience and threaten the kids with the big yellow bus and a trip to the local school. Other times, it’s more than a momentary exasperated thought. We all go through times in our homeschool journey where it just gets tough. One child refuses to do their math. (Hence the aforementioned headlock.) Another child cannot grasp the parts of speech. It’s been snowing and cold for what seems like an eternity and everyone has cabin fever. These are the times when we start looking into what it would take to ship the kids to school. Usually, by the time we get our research done, the math gets finished, the grammar lights come on, and the sun comes out. We live to homeschool another day. Ok, homeschool mom. What truth would you add to the list? If you don’t homeschool, which of these truths surprised you? Do you have a kid who has always had that entrepreneurial mindset? Do you want to teach your kids what it’s like to start and operate their own business? What are you waiting for? The process of starting and operating a business can be a great educational opportunity for kids. They can learn the ins-and-outs of how businesses work, personal responsibility, and finances. Plus, they can start small with what they have and what they know. Wondering what kind of business kids can start? Here are a few business ideas for your young entrepreneur you might want to consider. This is a great business opportunity for the young animal lover. Every neighborhood has pet owners. Kids can start by offering to walk a neighbor’s dog or feed their cat while the owners are at work or on vacation for experience and to gain a referral source. Once credibility is gained, make a flier and offer pet services for a fee to the entire neighborhood. Babysitting is often a girl’s first job. Parents are always looking for trustworthy babysitters for their kids, so jobs are usually easy to come by. Babysitting isn’t just for girls, though. Boys can start a babysitting business, as well. Often, parents of boys will look for an older boy to babysit. Tip: Get babysitter certified from the Red Cross for more credibility and marketability. Mowing lawns is a great summer business for kids. It’s the kind of service that keeps customers calling again and again all summer long. Kids can first gain experience in lawn care by mowing and trimming their own lawns. To start their own business, they just need that experience, a lawn mower, a trimmer, and a flier. Kids can stay busy all summer long and make a lot of money. Cars are always dirty – inside and out. This is especially true with cars belonging to families with children. Kids can offer to wash cars at their own home or the car owners’ home. They just need their own quality supplies and a vacuum that can be used for car interiors. We live in the digital age. Artistic kids who know how to use graphic design programs can start their own business designing business cards, logos, invitations, and more. They can sell their works and services locally and online on sites like Etsy. Tutoring is big business these days. Some parents are looking for ways to help their kids get ahead in school, while others are just trying to get their kids to understand math. If your child is good in school, they might be able to start their own tutoring business. Grocery delivery, Amazon, and online ordering from restaurants are huge right now. People love the convenience. They would rather have someone else do their running for them, so they can have time for the things they enjoy. If your teen has a car, they could start an errand service. Start with friends and neighbors and offer to run errands within a certain radius. Cleaning the house is something that many people hire out and it is something that many kids help with at their own homes already. Kids can start a house cleaning business by offering basic services like vacuuming, mopping, cleaning kitchen counters, and bathrooms. As they get better at cleaning, they can offer more. I dare say that a teen with their iPhone can take better quality photos than some professionals. I mean, look at their Instagram accounts! If your kid seems really interested in photography and has the talent, you might want to invest in a digital camera and let them start an event photography business. This would be a great service for families who want to take pictures of a birthday party or a sports event, but don’t want to take the time away from actually experiencing it. Is your child really creative? Do they design jewelry, create paintings, make soap or candles, or do woodworking? Selling their wares at craft fairs might be a great business to start. They can create all week and sell at local events on the weekends. Do your kids have the entrepreneurial spirit? Are they looking ways to make money? Have they started a business of their own? We’ve love to hear about it. The Micro Business Club will help teenagers earn money while learning how to start their own business. A micro business is simple to start, usually home-based, low risk, educational and easy for a busy student to run. This club will encourage students to come up with a viable business idea, avoid pitfalls, and start their business with no debt. The student projects will include: brainstorming ideas, conducting surveys to test their ideas, and creating a business plan. The second semester will explain sales and marketing techniques and wrap up with tips on customer service to keep the micro business going. Students will create business cards and flyers, design a website, and practice making a sales pitch. The Micro Business Club will be led by author and accountant Carol Topp, CPA who has encouraged thousands of teenagers to start a micro business through her presentations, PBS television show, and the Micro Business for Teens curriculum. The club projects will include worksheets from Carol’s Micro Business for Teens Workbook. Purchasing Carol’s books on Starting a Micro Business and Running a Micro Business is not essential, but the books will greatly enhance the club experience for an enthusiastic student. Click to learn more about this microbusiness club for homeschoolers.